Author Annette McGivney will be at Maria’s next week to talk about her new book, Pure Land. 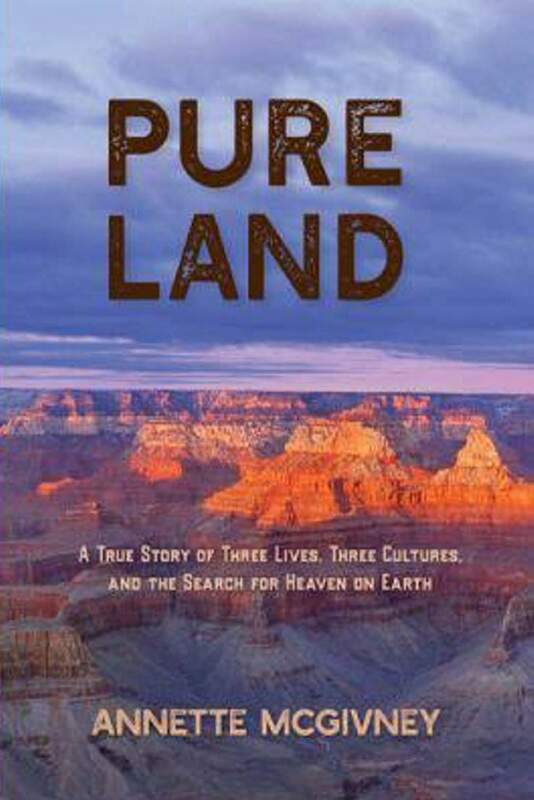 Pure Land, the third book by award-winning journalist Annette McGivney, is a riveting read. It is a story that intertwines three lives brought together by savage violence. It all starts with the brutal murder of Japanese tourist Tomomi Hanamure at the bottom of the Grand Canyon near Havasu Falls on the Havasupai Reservation on May 8, 2006. It was Tomomi’s 34th birthday. McGivney begins her combination murder investigation, social observation of the treatment of Native Americans and personal memoir with her being brought to a center to see a psychiatrist. She thought she was experiencing a mental breakdown. The author then leads readers to Tomomi’s story. Tomomi was from Yokohama, Japan’s second largest city, with a population of over 3½ million people. She was fascinated by Native Americans and their culture. She was a hiker and adventurer. She mostly traveled alone and rented cars, visiting out-of-the-way places that had significance to the various tribes. She stayed at a hogan, with no amenities, on the Navajo Nation and in small motels on the Sioux reservation in South Dakota. On her final trip West, she was going to treat herself to viewing Havasu Falls on her birthday. But because of a fateful chance meeting with Randy Wescogame, she never made it. Wescogame was a troubled 18-year-old who lived in the village of Supai. He came from a home that was not just broken but shattered. He was tossed back and forth between his mother, father and foster care. He was beaten many times and had turned to drugs. The brutal nature of Tomomi’s death garnered national attention. McGivney, the Southwest editor for Backpacker magazine, investigated and wrote an article called “Freefall” for the June 2007 issue. During her work on the article, she felt a bond with Tomomi and became drawn to tell more of her story. Wescogame was arrested and finally confessed to murdering Tomomi. There was no trial, and he was sentenced to life in prison. McGivney was able to connect with Tomomi’s father and eventually, while researching this book, traveled to Japan with her son and an interpreter to talk to those who knew Tomomi best. In Japan, McGivney discovered that Tomomi took a lot of pictures and kept journals on her many trips to the West. Using these journals, McGivney was able to follow in Tomomi’s footsteps to be able to understand what drove her to visit so many times. When McGivney pursued what brought Wescogame to such a violent act, she learned about his horrific home life. During her quest for answers, McGivney was under severe stress, writing to deadlines, going through a divorce, being a single mother and also taking care of two parents with Alzheimer’s. It was too much. She began to suffer nightmares and flashbacks. Insomnia and stress led her to discover long-suppressed memories from her own past. Seeking treatment, she was diagnosed with Delayed Onset PTSD. She had been severely beaten and abused as a child. Writing Pure Land and including her own trauma is an act of pure bravery. She has deftly woven together the lives of three disparate people into a compelling, fascinating read. Because McGivney believes in the healing power of nature, she has founded a nonprofit program to help children who are victims of domestic abuse. The Healing Lands Project aims to heal family violence by providing trips into the wilderness. Information about this can be found at www.iampureland.com. McGivney donates a portion of each sale of her book to this cause. What: Annette McGivney will discuss her new book, Pure Land. More information: Call 247-1438 or visit https://bit.ly/2qr5Bmc.